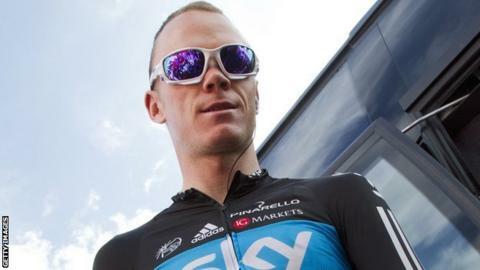 Tour de France runner-up Chris Froome fears several members of Team Sky will lose their jobs as a result of an investigation into past drug use. Team Sky has a zero-tolerance approach to drugs and has asked all staff to sign a statement pledging no previous involvement in doping. The team has previously said anyone who refuses to sign will be sacked. "That's going to be part of the losses the team has to make to be able to go forward," Froome told BBC Sport. However, Team Sky chief Dave Brailsford has indicated that his stance may be softening and any offenders may not leave. He said every member of staff would be spoken to and "given an opportunity" to talk about their past experiences. "My view isn't draconian," Brailsford told BBC Sport. "We've decided to sit down and talk to every single member of staff. "People will be given an opportunity - if they represent a risk to the team going forward - to talk about it, to see if we can reconcile that and support people. It's actually been a very constructive process." Froome, who finished second behind fellow Brit Bradley Wiggins at this year's Tour de France, added: "I've had my interview, it was very straightforward." He said he was asked if he had "done anything" or was "likely to be linked to anything". When he replied "no", he was told to sign the statement. "I wish it was that simple for everybody on the team," Froome said. "[But] we have staff and riders who rode in that time [the Lance Armstrong era]." Froome, 27, called on Armstrong to confess to doping so that "a chapter could be closed". Armstrong was stripped of the seven Tour de France titles he won between 1999 and 2005 on Monday. "I think it probably would help people to move on because, at the moment, there's a lot of finger-pointing and anger towards him," Froome said. Froome could take over from Wiggins as Sky's team leader at next year's Tour because of the more mountainous route and said he was relishing the challenge. "The first eight stages haven't got many mountains to really split the race up, so that's going to be a nervous period until then," Froome said. "I think the race will be decided between stages 17 and 19 and because of that, it's going to be quite a stressful race for the general classification riders until that point."